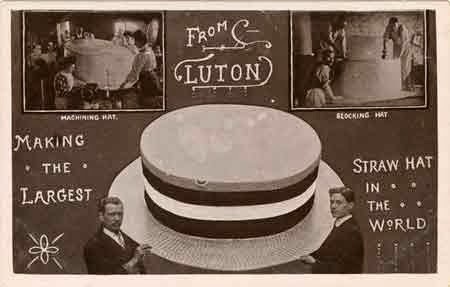 Monday 2nd November 1914: A Luton correspondent has been taking stock of the current state of the hat trade in the town. There is no doubt the war is having an effect on the industry. At this time of year the hat manufacturers provide novelties in style for the coming season. In the past they have chosen from a range of novelties brought to Luton by sales representatives from Paris firms. This year they have had to develop their own. At least one manufacturer believes they have been as successful with these as they would have been with the Parisian styles. The straw hat industry has been severely depressed and business has been made up through busy trade in velvet hats. In the early autumn firms were afraid that they did not have sufficient velvet to meet demand. As a result they bought in large supplies – too large in some cases, leading them to reduce the price of the finished hats. The only fabric which did prove to be in short supply was high grade velour, which comes from Vienna. Although it is hoped the straw hat trade will pick up again, it is a source of concern that if the war continues until the spring the hundreds of thousands of men now in the forces will be wearing regulation headgear rather than straw boaters. Another difficulty caused by the war is that sales abroad have been disrupted, particularly with Holland and Canada, On the positive side, it is possible that a new market may be developed with Americans who have lost access to supplies from Vienna and Paris.